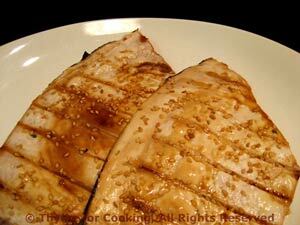 Grilled Teriyaki Swordfish, Thyme for Cooking easy gourmet dinner. Swordfish is easy to get here, and not much more costly than salmon (which is relatively cheap). You can substitute any firm , thick fish suitable for grilling, whatever is good in your market. 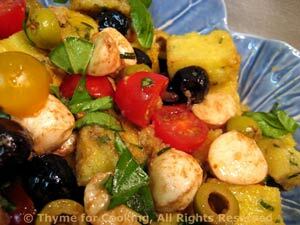 And, you could actually use stale bread for the salad. This is salad night.... Easy. 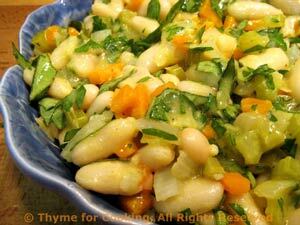 Lightly sautéed carrots and onions add color to this easy salad of cannellini and celery. Lots of fresh herbs and a lemony vinaigrette finish it. For a light lunch, add some good, canned tuna and crusty baguette. Chop onion and carrot; mince garlic. Heat oil in medium skillet. Add carrots, onions, garlic and sauté just until tender, 5 - 8 minutes. Remove and put into a bowl. Drain, rinse beans and add to bowl. Slice celery and add to bowl. Snip basil and chives; add to beans. Arrange 3 - 4 nice lettuce leaves on salad plates, put bean salad on top and serve. Squeeze 1/2 lemon if using. Put vinegar, lemon juice and mustard in a small bowl. Whisk well. Add oil very slowly, whisking constantly. It should incorporate as you add it. If it does not, stop adding oil for a few moments and just whisk. Continue until all oil is added.